and other Lepidoptera that feed on foliage. 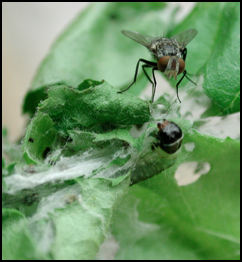 Biological control occurs when pest populations are reduced by their natural enemies. All pest species have natural enemies. The effect of biocontrol can be enhanced by importing enemy species from the pest’s native country, increasing the number of already existing natural enemies, or working to conserve the natural enemies that are already present. A research project, led by Vince Jones at the WSU Tree Fruit Research & Extension Center, is looking at ways to improve biocontrol and reduce the negative effects of pesticides on natural enemies.